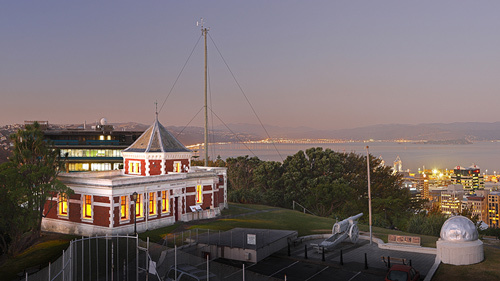 If Wellington is the coolest little capital in the world then the Dominion Observatory is arguably the coolest little office in Wellington. 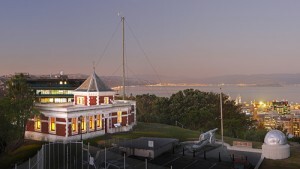 Where else can you find a workplace with a cannon and flagpole on the front lawn, in a category 1 historic building with sweeping views over the city and harbour, situated in the Botanic Gardens just 80m from the cable car top station and only 10 minutes walk down to the CBD? This is a rare opportunity, prompted by the impending move of an existing tenant who has expanded and now needs larger premises. The rentable space on offer totals around 60 sq metres, not counting shared areas such as the entrance hall, kitchen and washroom. The layout would suit either a single enterprise with 6-7 staff, or two separate enterprises of 3-4 staff each. The building has a security system and UFB. Carparks and/or office furnishings are available if required. Please contact Geographx if interested. ← Charlie Douglas – explorer, surveyor, geologist and…… cartographer!